Thankfully, PBS broadcasts our nation’s Capitol 4th of July for those who must witness it from afar. When I get home from the local fireworks, I automatically flip on the channel. If you have never been to Washington, DC, you are missing something significant. It’s a gift of a lifetime trip that every American should be privy to. The museums, statues and other landmarks are all free, so no one is left out from seeing the attractions as long as you can get there. When 9/11 happened, the USA rallied and we Americans showed our support for one another by decorating our homeland. It’s a shame many of the flags, banners and other signs of patriotism have since disappeared. They are good reminders of the freedoms we enjoy and are worth, literally and figuratively, fighting for. And, why do we save our patriotic songs for Independence Day? In my opinion, they ought to be sung more often! Here are 100 patriotic favorites. How many do you recognize? Many of the tunes tell the tale of our country’s heritage, and it is important that all generations of Americans know the most famous anthems. 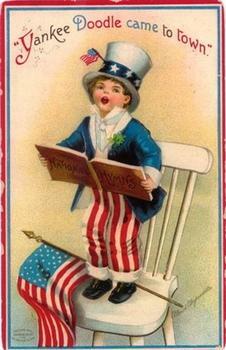 Have a Yankee Doodle Dandy kind of day! On Monday on All Things Fulfilling, I will share reflections of my 4th of July celebrations from Ski Town, U.S.A.